AN IMPORTANT PAIR OF EARLY GEORGIAN ARMORIAL HALL CHAIRS, GEORGE III, CIRCA 1720-30, BEARING THE MARITAL ARMS OF HINDE & HARDCASTLE. Each in beautifully patinated heavy grained Cuban mahogany. 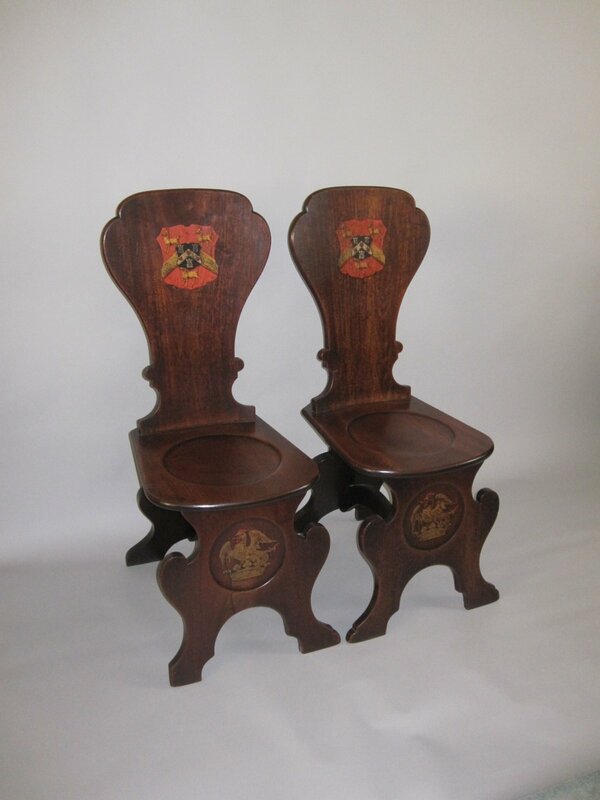 With a silhouette shaped backrest inset with a painted armorial bearing the Arms of Hinde & Hardcastle, over a balloon shaped dished seat, supported on silhouetted and srched front and back legs, the front also dished with a painted crest for Hinde. Robert and Elizabeth were married on 25th April 1695 at the Parish Church of St. Nicholas Cole Abbey in the City of London. The Hinde family settled in Holborn on the Western boundaries of the city, and gained wealth and position in the City as brewers; several of the gentlemen of the family being admitted to the Worshipful Company of Coopers of the City of London.